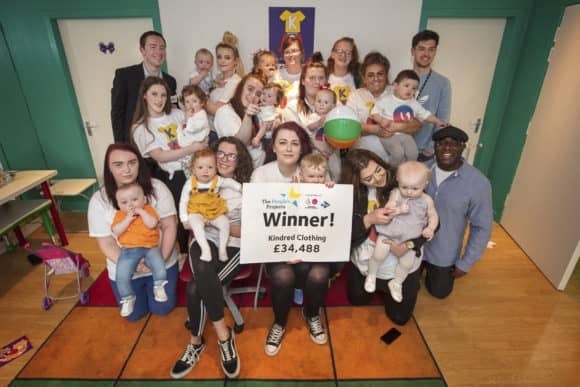 A Dundee community project, created by and for young parents, has won a National Lottery grant following a monumental public vote. 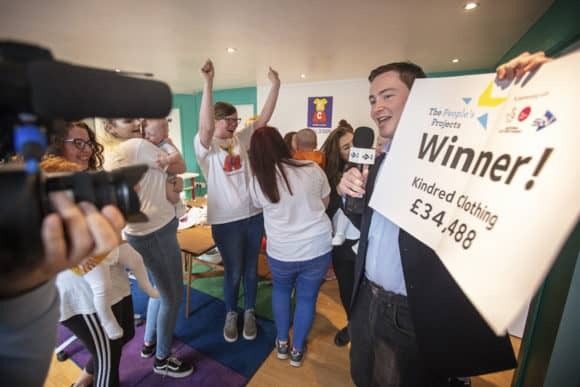 Led by Front Lounge, the ‘Bringing Up Baby (BUBS)’ ‘Kindred Clothing’ project was presented with a cheque for £34,488 from The People’s Projects (STV North) live on television last night (Thursday 3 May 2018). The competition allows members of the public to vote for worthy projects within their local communities. The group aims to build the skills, confidence and networks of vulnerable, young families by supporting parents to design and make clothes, learn new skills and make friends while their children play. Ultimately, it is hoped that those attending will leave with an official accreditation. Kindred Clothing will feature sessions at Front Lounge’s Hilltown premises, as well as showcase events and visits to creative venues. The weekly sessions will be led by young parent volunteers, supported by a Community Learning and Development (CLD) Worker, with a Making Practitioner facilitating the creative sessions. The programme will include tailoring, knitting and quilting, with the added opportunity for parents to design their own fabric through screen-printing. The grant will also help pay for materials and machinery, toys and a Play Worker, allowing parents to concentrate on their crafting knowing that their children are being looked after just a few feet away. Meanwhile, Chika Inatimi, Project Leader commented, “We are absolutely thrilled to have won this funding. It’s a fantastic endorsement by the local community who came out in huge numbers to back us and we are extremely grateful for their support. Samantha Paton, whose fashion brand Isolated Heroes held a masterclass for the group recently added, “We are absolutely delighted but not surprised to hear that Kindred Clothing has won The People’s Project competition.